The past week began with Kitty and I being dropped off at out school. Naturally, I was anxious about arrival. What would the school be like? Would the staff be friendly? However, we were received with open arms and friendly faces which put my mind somewhat at ease. The school is absolutely beautiful! I knew coming into it that it was a well-off school, but it still far exceeded my expectations. And the location in it of itself is beautiful. From the soccer field (I seriously almost just wrote football pitch… I’ve been away too long!) you can see a gorgeous panorama of mountain ranges, including the Langtang Range where we went trekking. Still, beauty and such aside, I was nervous! Kitty and I spent the first few days observing and getting used to our surroundings. We sat in on the English lessons of classes 3, 4 and 5 (ages 8 – 12) and did our best to settle in. We are staying in an apartment-like setting as opposed to staying in the school’s hostel as we originally thought. The building we are staying in is across from the girl’s hostel, where we have dinner, and we share a room. We share a bathroom also and it has a nice hot shower! (Though, still no western toilet). A teacher, Bharun, from the school lives above us, but more on that later. The first few days teaching have been quite challenging! The class sizes are very big (about 30 students) and the classrooms are tiny, despite the school’s resources. It is tricky to find creative activities to do with the kids with such constraints. Plus, the kids are quite used to having volunteers around, so the first thing they think when you walk in is, “Games! Games! What are we playing today? !” And, as volunteers, we have no syllabus which makes it difficult to know where to start. (This has many advantages though too, as we don’t have to reach a certain point either). So the task ahead is a bit daunting at the moment, but I think the first week went well. That’s pretty much it as far as the teachings of “Erin Ma’am” (Yes, that is what they call me!) for now, but I will be sure to keep you updated! Despite enjoying my time in the school, early in the week I did begin to feel a bit homesick. We were in yet another new place and now we weren’t even with the whole group, so I was missing them too. It was just so much change! Tuesday, as if on cue, there was a knock on our door. I opened the door to find Sujata, Bharun’s wife, standing in the doorway with their almost 1 year old son. She had come downstairs to introduce herself and make us feel welcome. She showed us around the building a bit more (the terrace, kitchen and introduced us to her in-laws who also live above us). And most importantly she made it clear we were like family now. It was so incredibly nice! Immediately, my discomfort in our new environment began to melt away. That night, Kitty and I had tea (delicious Nepali tea!) with Bharun and Sujata and met Bharun’s niece and nephew also. Basically, Bharun’s family, his brother’s family and his parents share an entire flat (1 floor). Kitty and I are in a room below and on our floor there is also a volunteer from China and a room for the principal to stay in some nights during the week. I feel so lucky to be living where we are. It was such a nice surprise to be welcomed into a family and experience family life when we originally thought we would not have one (as many other volunteers do). And they are just absolutely lovely too! I think we are celebrating their son’s birthday this Friday so I’ll let you know how it goes! 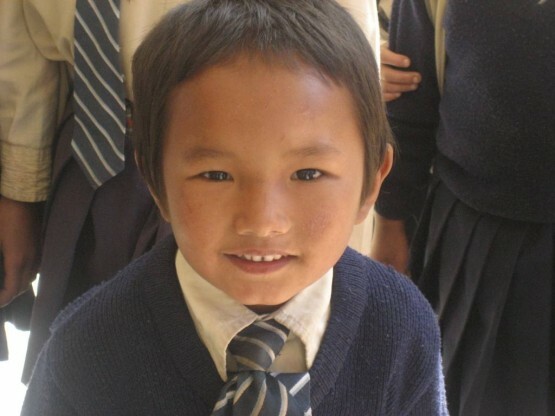 Find out more about teaching in Nepal by following our gap year in Nepal link.